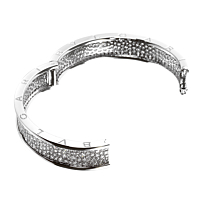 Opulence is the operative watchword behind this stunning B.Zero1 Diamond Bangle Bracelet from Bulgari. Immaculately-crafted 18k White Gold forms the underlying design of this piece, complete with signature BULGARI engravings along the rims. A jaw-dropping 10.0 carats of Diamonds glisten all along the bangle's outward side, imbuing this fine luxury piece with a sense of majestic radiance which is nearly unequalled in the world of jewelry.